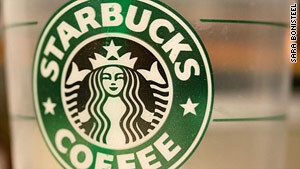 Starbucks plans to add something new to coffee that customers buy for home use. (CNN) -- In an ever-evolving, increasingly crowded beverage market, Starbucks is waking up and smelling the coffee. The problem is it's not their house blend. "Here's a statistic that people are surprised by. Despite the long-term success that we've enjoyed, we have less than 10 percent share of coffee consumption in North America. And less [than] 1 percent share internationally," Starbucks Chairman, President and CEO Howard Schultz told CNN Money. Advertising Age also recently pointed out that despite Starbucks being the world's largest coffeehouse chain with more than 13,000 locations in more than 50 countries, even its most devout customers purchase only three of every 10 cups of coffee they drink from Starbucks. So, who is stealing Starbucks' mojo? Folgers, a division of J.M. Smucker Co., is still the largest producer of retail packaged coffee in the United States. Its coffee brands include Folgers and Millstone, and it also manufactures and distributes Dunkin' Donuts coffee to sell in grocery stores. Then there is the other American coffee titan, Maxwell House, which is a Kraft Foods brand. Kraft reported soaring earnings in its 2010 first quarter, linking the growth to new advertising and innovation behind existing Kraft brands such as Maxwell House. This competition is stirring Starbucks to step up its home-brewed strategy, partially by adding some flavor. An AC Nielsen panel recently found that more than 11 percent of American households purchase flavored coffee for home use, making it a $265 million business in the United States. Starbucks Corp. will enter the fray in June when Starbucks Natural Fusions, in vanilla, caramel and cinnamon, arrives at grocery stores. Additionally, Starbucks wants to capture a larger share of the U.S. brewed coffee market by leaning on its VIA Ready Brew line and Seattle's Best coffee brand to increase the number of distribution points. Starbucks acquired its former competitor, Seattle's Best Coffee, seven years ago. "We are uniquely positioned to reach into these channels because of the brand equity and trust we build with the customers who come into our stores," Starbucks said in a statement to CNN. Seattle's Best, in part, will take aim against Starbucks' typically lower-priced, quick-service rivals such as McDonald's and Dunkin' Donuts. In a new rebranding effort, Starbucks plans to distribute the Seattle's Best brand in Burger King and Subway restaurants nationwide. McDonald's coffee sales have increased every year since the company first introduced its McCafe line of premium coffee in 2006. In April, McDonald's announced its U.S. comparable sales rose 3.8 percent, citing beverages, including the new McCafe offerings such as Frappes, as a top contributor to that growth. Despite all this, Starbucks CEO Schultz said the expanding marketplace might just be an advantage to all of its players. "The level of awareness that was created by McDonald's' tens of millions of dollars of advertising created more trial in the marketplace and differentiation."